This 2.5-hour tour includes a narrated (often humorous and enlightening) look at the city. As the sun goes down and the moon raises over Washington DC, the various attractions in the city become illuminated by their own unique spotlights, causing some to glow blue and others green and white. Even if you've visited each of these sites during the daytime, seeing them at night provides you with a whole new look at each monument, making them just as exciting as the first time you saw them. Especially beautiful at night, this memorial, known officially as the U&period;S&period; Marine Corps Memorial, honors Marines who have fallen in the line of duty. Take in the different aspects, especially the statue of the flag raising on Iwo Jima, one of the most well-known events from World War II. Admire the Franklin Delano Roosevelt Memorial in the dark, which honors our 32nd President and the 12 years of American history during his time in office. The outdoor galleries are divided into four sections, each representing one of his terms in office, with a wide variety of sculptures, quotations, waterfalls and pools, quiet alcoves, and many other symbolic works of art. 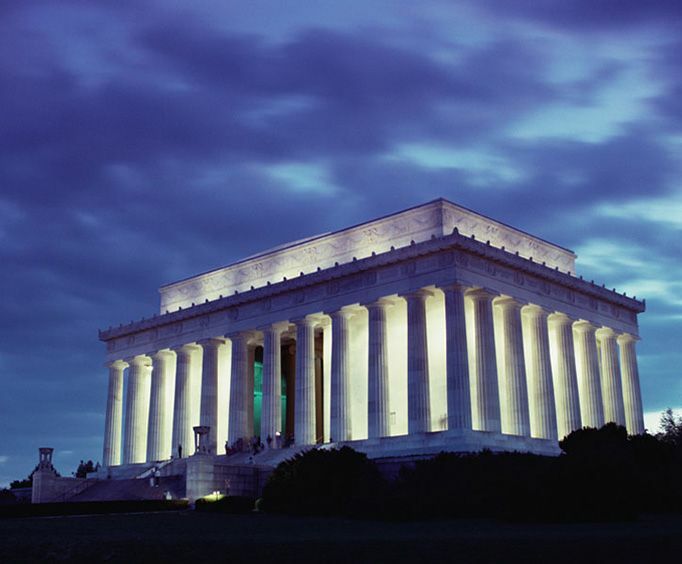 Built to honor the 16th President, the Lincoln Memorial is in the form of a Greek Doric temple with a large seated sculpture of Abraham Lincoln. While you're admiring the statue on your evening tour, make sure to read the inscriptions of two well-known speeches by Lincoln, The Gettysburg Address and his Second Inaugural Address. This national memorial honors U&period;S&period; service members who fought in the Vietnam War, those who died in service in Vietnam and South East Asia, and those who were unaccounted for during the war. While you're there this evening, make sure to take in all three separate parts, the Three Soldiers statue, Vietnam Women's Memorial, and Vietnam Veterans Memorial Wall, the best known part of the memorial. Located in West Potomac Park, the Korean War Veterans Memorial was built to commemorate those who served in the Korean War. This memorial serves as a place of reflection for visitors as they walk through the 19 stainless steel statues that form a squad on patrol. Located near the Tidal Basin, the Martin Luther King, Jr&period; Memorial was opened in the fall of 2011 to honor Dr&period; King. Although he isn't the first African-American honored with a memorial, his is the first near the National Mall and only the fourth non-President to be memorialized in such a way. Admired for its beautiful gardens and extensive offices, the White House can be seen all lit up on this tour, which offers stunning views of the building and grounds. Inside the complex is the Executive Residence, West Wing, East Wing, Eisenhower Executive Office Building, and Blair House, a guest residence. See the U&period;S&period; Capitol located on Capitol Hill, where legislators conduct their daily business. Each year, more than three million visitors from around the world visit the Hill to explore this living museum of American history and see democracy at work. On this tour, you will have fantastic sights of this majestic building, lit up for stunning views up close and from afar. As you travel about the city, your guide will provide you with plenty of historical information and some stories you may have never heard before, such as the ghost stories of the various spirits that call the nation's capital their home. This tour is unlike any other as you get a look at the city from a different perspective along with entertainment from the driver of your trolley. Don't forget the camera to capture these memories! We really had a great time on the monuments by moonlight tour. I enjoyed it very much, as did my children. The guide was very knowledgeable -- and quirky enough to keep it interesting. The only suggestion i have is to make the departure time more clear. When i bought my tickets online, the web said that we would depart at 7:30. However, when i called to confirm our reservations the day before, i learned that we were to leave at 6:30. The woman on the phone couldn't even find our names to confirm our reservations, so i was a bit nervous. Uncertain as to what time we were really leaving, we showed up at 6:00 just in case. But it all worked out well and we would definitely want to take the tour again. I've already recommended to several others. Thanks so much. "This was a great tour!" This was a great tour! I would do this again. Our guide was great and gave alot of information about the sites we visited. The monuments are beautiful at night! It was an enjoyable time looking at the monuments at night on the trolley car. I would recommend it to others. The only downfall was the seats were very small to fit two people in them. The most fun we had on our entire trip to dc, this was absolutely the highlight. We learned so many fun facts about the area, saw sights at night that we would not have otherwise traveled to on our own, and to top it off had a wonderfully funny, energetic, and very knowledgeable guide. We would definitely highly recommend this tour and just joe (our guide). Tip: Here's a tip - book this tour if you're gonna be in dc, you won't regret it.